Spotify users in the U.S., Canada, and the U.K. now have an easier way to get fleeced by overpriced concert tickets thanks to the launch of a StubHub Spotify app. Or, to put it in a nicer way, the new Spotify app helps connect you and StubHub’s ticket sellers so you won’t miss out on that once-in-a-lifetime opportunity to see your favorite band’s sold out show. With the new StubHub Spotify app, you can search for specific artists or see upcoming shows in your area, and then buy tickets for them at outrageous prices. 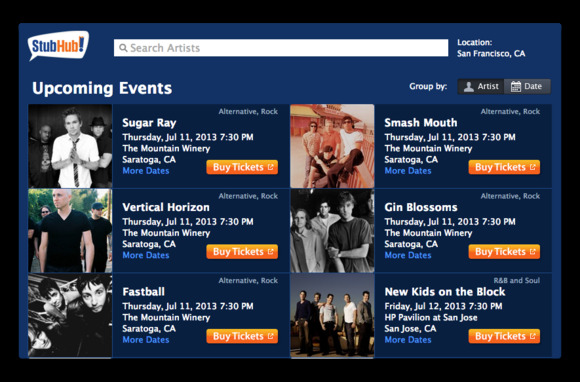 The StubHub app lets you set a city and shows you upcoming concerts nearby. You can choose to group the results chronologically by artist, or by the concerts for each day. 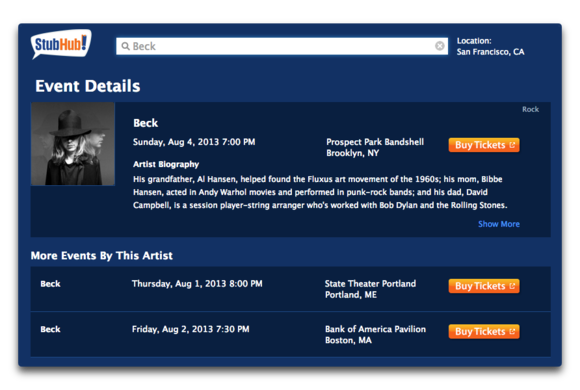 Alternatively, you can search for a particular artist and see all their upcoming shows. When you find what you want, click the big orange Buy Tickets button to be taken to that show’s page on the StubHub website and see humanity at its most larcenous. Want to see Kid Rock with ZZ Top and Uncle Kracker at Shoreline Amphitheatre? Tickets on the Live Nation site top out at $150 for Official Kid Rock Platinum Seats (plus various and sundry fees, of course). Via StubHub, you can get lawn tickets for $1000 a piece. What a bargain! After this story was posted, a StubHub representative reached out with a statement regarding ticket pricing: "We allow users to set prices on StubHub, we do not set the prices ourselves. For the seats mentioned above, there were lawn seats available on StubHub for $34.95. One user chose to set a price for $1000, but that does not reflect how much these tickets were generally going for. Likewise, more than half of all tickets on StubHub go for face value or below."